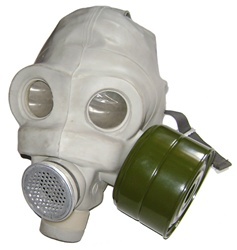 The Soviet PMG KM-16A gas mask was used during the 1970's in both Russia and Hungary. The Hungarian version differs slightly from the Soviet version but is structurally identical for the most part. Both gas masks were made from gray rubber with two optical glass eye pieces, a speech diaphragm on the front and an exhale valve on the bottom. This is the same gas mask that was used at Chernobyl in 1986. The gas mask comes with an olive drab carrying bag and filter.